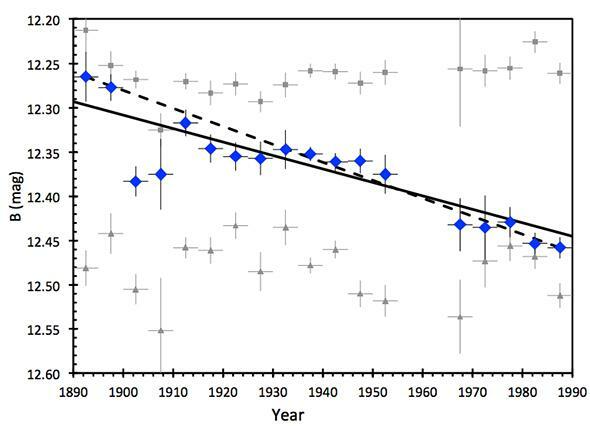 Tabby's Star faded substantially over past century. Nope, it’s still not aliens. But it’s still really weird. This photo is an Internet meme and is everywhere. This specific instance is from Quickmeme. OK, this is getting pretty weird. 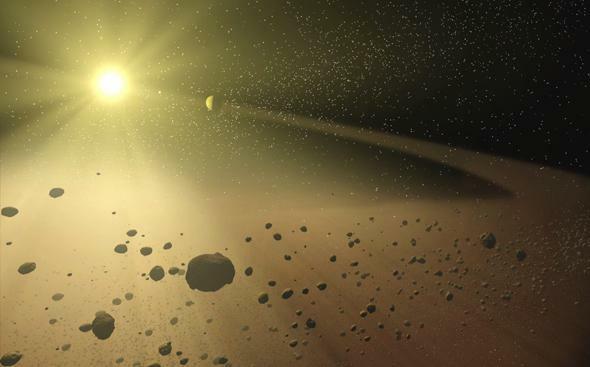 First, a little background: You’ve probably heard of the star KIC 8462852 (though maybe by it’s nickname, Tabby’s Star, after Tabetha Boyajian, the woman who led the team that discovered its behavior). It’s the star that got a lot of press late last year because it was acting funny. Astronomers poking through the observations of the star by the Kepler spacecraft found it was undergoing a series of apparently random dips in brightness. Some of these dips were serious, with the amount of starlight dropping a staggering 22 percent. That’s a lot. It couldn’t be a planet passing in front of the star, because the dips weren’t periodic, and the amount of starlight blocked is different every time. Plus, even a planet as big as Jupiter (which is about as big as planets can get) would block less than 1 percent of the star’s light at best. In the original paper, Boyajian and her team make a good case that the dips are not caused by some odd thing going on in the data themselves or in their analysis of them. Whatever is going on, it’s real. They go through a bunch of possible scenarios that might be causing the dips and wind up eliminating most of them. The most likely scenario, they conclude, is that there is a huge family of comets orbiting the star, and some of them collide to create huge debris clouds that block the starlight. As I explained in my original post, that explanation has problems, too. 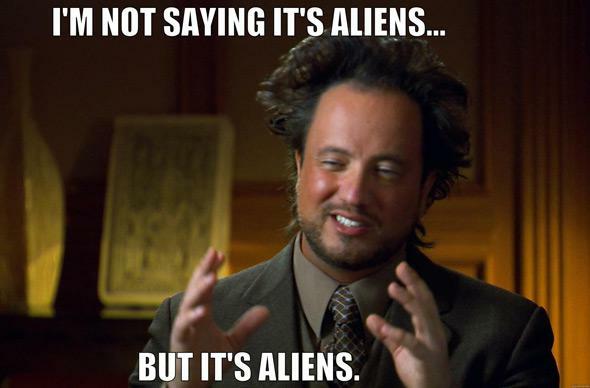 That left some speculation about, um, aliens. While it’s incredibly unlikely, it does kinda fit what we’re seeing. An advanced civilization would have big energy requirements, and it would make sense to build huge structures around their star to capture as much light as possible for solar power. The dips in light we see are then these “megastructures” passing in front of the star (some people call this a Dyson swarm, a collection of enormous solar panels enclosing the star). Because why not, some follow-up looking for alien signals was made, but no dice. That’s not terribly surprising. The idea that this is all due to aliens is a bit, um, out there. But still, the star is weird. And we just found out it’s even weirder than we thought. Bradley Schaefer is an astronomer at Louisiana State University. He’s a clever fellow and has a habit of thinking outside the box when it comes to astronomical mysteries. When it came to Tabby’s Star, Schaefer realized there might be older observations of it that could help inform its study. He found that Tabby’s Star has been photographed more than 1,200 times as part of a repeated all-sky survey between the years 1890 and 1989. Using two different methods, he examined those observations and measured the star’s brightness over time. Tabby’s Star is fading over time. The blue diamonds are measurements made between 1890 and 1989. The solid line is a linear (straight-line) fit to all the data while the dashed line is just a fit to the starting and ending points. The gray points are from two other stars as controls; they don’t fade over the same period. What he found is rather astonishing: The star has been fading in brightness over that period, dropping by about 20 percent! That’s … bizarre. Tabby’s Star is, by all appearances, a normal F-type star: hotter, slightly more massive, and bigger than our Sun. These stars basically just sit there and steadily turn hydrogen into helium. If they change, it’s usually on a timescale of millions of years, not centuries. Schaefer examined two other similar stars in the survey, and they remained constant in brightness over the same time period. The long-term fading isn’t constant, either. There have been times where the star has dimmed quite a bit, then brightened up again in the following years. On average, the star is fading about 16 percent per century, but that’s hardly steady. So it appears Tabby’s Star dims and brightens again on all kinds of timescales: hours, days, weeks, even decades and centuries. Again. That’s bizarre. Nothing like this has ever been seen. So what’s causing this? Well, think Occam’s razor. The simplest explanation is probably the best place to start, and in this case that means one thing is probably behind all this weird behavior. Schaefer looks into this in his paper and concludes that the comet family idea doesn’t explain all the behavior. It might explain the short-term dips (maybe, kinda) but are hugely unlikely to be behind the long-term fading. You’d need truly vast numbers of comets, and they’d have to be huge, much larger than reasonable. And they’d have to be slamming into each other just as we happen to be looking. However, this doesn’t work well either. Why did the star dip so much in the 1910s, then regain brightness a few years later, for example? Also, blocking that much of the star over a century would mean they’d have to be cranking out solar panels. The star has a diameter about 1.6 times the Sun’s. To block 20 percent of its light would take solar panels equaling an area of over 750 billion square kilometers. That’s 1,500 times the area of the entire Earth. Yikes. And that’s only if they happened to place those panels perfectly between their star and us. More likely they would be in a ring or a sphere, so the actual area would be far, far larger. Several trillion square kilometers at least for a ring, and much more than that for a sphere. That’s a heckuva long-term project. So I’m still not saying aliens. But whatever it is behind this star’s peculiar behavior, it’s either something we’ve never seen before, something we have but that is on the extreme edge of what it can do, or perhaps more than one phenomenon acting together. I’ll admit, I’m scratching my head over this one. The only thing I’m sure of? We need to keep observing this star. If there’s one thing scientists love, it’s a mystery. Update, Jan. 18, 2016, at 19:00 UTC: This just occurred to me. In an earlier post I talked about and linked to an idea that the star is a rapid rotator, so it’s squished through the poles. That can affect the light we see from it. If the star is also precessing—changing the direction in space where its axis is pointing—that would cause a slow change in brightness over time, too. Hmmm. I may have to email a few folks and see if this idea has some stickiness to it. EDITED TO ADD: The conversation is ongoing, but astronomer Jason Wright points out that my ideas probably don’t work. Drat.